I GASPED When I Saw LinkedIn's New Invitation to Connect! Home » I GASPED When I Saw LinkedIn’s New Invitation to Connect! Connecting on LinkedIn has gotten harder. But that’s so limiting! Sure, most of us try to connect with only people we know and trust but there are times when we want to connect with someone new. When you connect with a person on LinkedIn, you typically have to state how you know the person. When connecting with someone you don’t know all that well, it doesn’t seem right to choose colleague or friend or schoolmate. But there was an option that could still work… GROUPS! All you had to do was select a LinkedIn Group you had in common and connection could be requested. Sadly, things have changed. LinkedIn removed the ability to choose a shared Group as a reason to connect. Why would LinkedIn do this? I am going to take a wild stab and say… it’s all about the money. Choosing Groups was a way to get around paying for LinkedIn. By selecting a shared Group, you could maneuver around the premium options of sending an Open Profile message or an InMail. 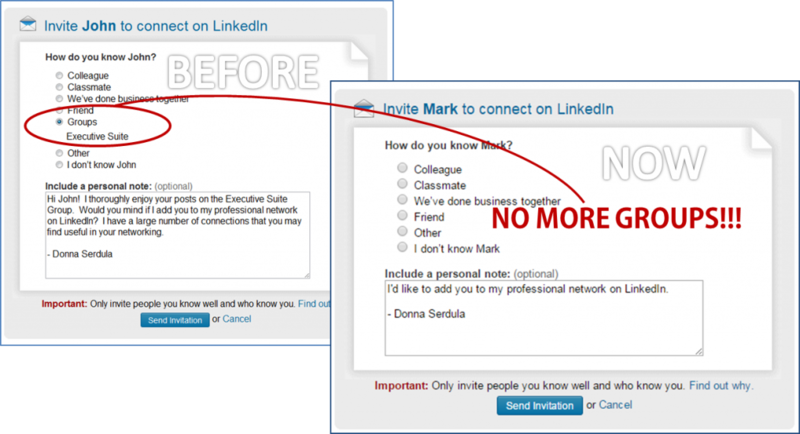 Removing this option pushes the LinkedIn user to upgrade. How Do I Connect with People I Don’t Know? 1. Choose Friend! The only issue with this is if your account is restricted (You’ve been marked as I Don’t Know by more than just a few people), you will be prompted to enter the person’s email address. If you don’t know their email address, check out their profile to see if they posted it within the summary or another section. You can also Google their name and see if their email is floating out there on a bio or company Website. Still can’t find their email address? Try the old Jigsaw.com now named Data.com since acquired by Salesforce.com. 2. Create a Job Experience for connecting Add a new position to your LinkedIn profile. Give it an old date (so it sits at the bottom of your experiences) and create a company name of, “I’d like to get to know you” or something to that extent. The job title can be something like, “Networker.” Within the Connection Request invite, select We’ve Done Business Together and choose this company. When going this direction, it is so imperative to include a personalized note! You need to tell the person who you are and why they should accept you into their network. If you can’t offer that information, connecting may not be a good idea. 3. Skip Connecting and send a OpenProfile InMail. 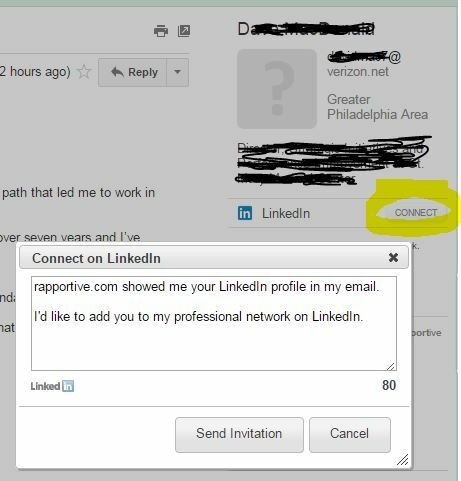 This option requires that both you and your target are paying members of LinkedIn and both opted for OpenProfile. 4. Connect with people via your smartphone’s LinkedIn App. When you connect on the LinkedIn App, that invitation is sent so quickly you don’t have to specify how you know them or include a personalized note. (I am not a proponent of this method since I do believe a personalized message is a must when connecting to someone you don’t know all that well). 5. Connect through Rapportive. Rapportive is an email extension that shows you everything about your contacts right inside your inbox. Hovering over an email address will show you more information on the person and whether you are connected on LinkedIn. If you aren’t connected, click the button and all you have to type is a note! 6. 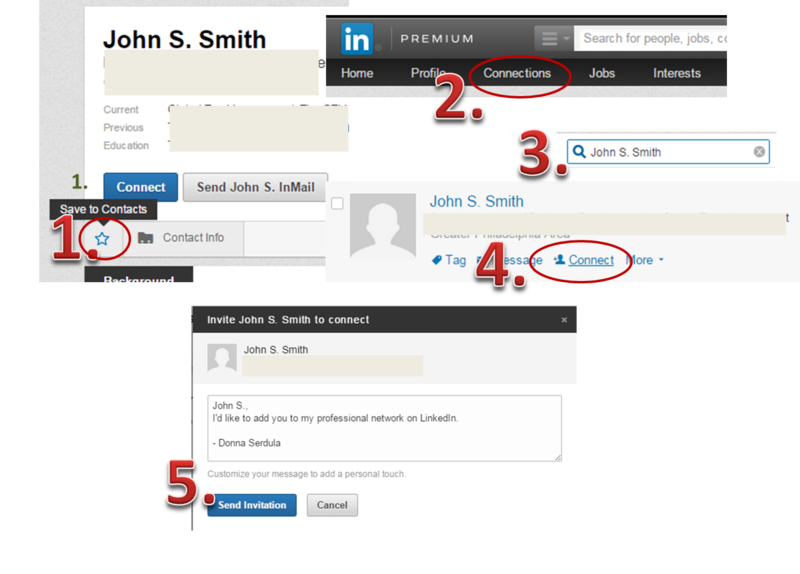 Add people through the Connections page Within the person’s LinkedIn profile, click the Relationship star icon next to the Contact Information tab. Click Connections on LinkedIn’s navigation bar. Click the search icon within the Connections page and search for the person. Hover over their record and choose Connect. Beware When Connecting with Strangers! It’s important to warn you that LinkedIn really means it when they say, “Only connect with people you know and trust!” When you go against their wishes, you are putting your LinkedIn account at risk. When you send an invitation to connect, the recipient can choose to report you as a person they don’t know or worse… a SPAMMER! After a few people report your invitations, you will find your account restricted and you can only connect by entering the person’s email address. My suggestion is to connect with people you know or connect to LIONS. When you do decide to take a risk and connect with someone you don’t know all that well, include a compelling personalized note. So what do you think? Do you have any suggestions on alternative ways to connect with people on LinkedIn? Please scroll down and let us know in the comments! Another excellent article with valuable information. Thank you Donna! I’d like to share with you and your readers an additional technique I use with success. I message a targeted LinkedIn members or free by sending it through a group we share. I do this by visiting the group, clicking “members” then I type their name in the search field. Once is find them, I message them, not to sell, but to introduce myself. I find common items like shared connections, industry, or discuss trends and include that in my short message. I made the one click connection invitation link for free at bitly. How does this approach sound to you Donna? Follow the money if you want to know why anything is done. I think you are right. The whole In-mails, introductions and don’t send invites to people you don’t know, is protectionism. I had my premium account suspended for sending an invite to someone I didn’t know personally – yet when I look at the accounts of those who work for Linkedin they have also have thousands of connections. In frustration I set up a group that people could Join & Connect for Introductions but only if they are happy to connect with the other members and also happy to introduce their connections. It grew so quickly because people want to connect to people they don’t know! I think Linkedin is driving people away I use Facebook more often now for business. LinkedIn has indeed become so restrictive that I am now in search of an alternative way to meet business people within my industry that I do not know. That is the point…meet people you do not know but have some common ground with. It used to be easy to network on LinkedIn and meet business people who you had something in common with. When I go to a social event, let’s say a Chamber of Commerce event or a tradeshow, I meet lots of people I don’t know. I exchange business cards and sometimes we do business together and sometimes we do not. LinkedIn used to be a place I could do the same thing only do it internationally. Now I, like DennisS1, am just trying to find another social media site to do this again. Open to suggestions. Great article and quite informative too. I though do find it ridiculous the very premise that LinkedIn uses “connect with people you know”. That so completely doesn’t make any sense at all in a professional scenario. Why would I want to connect with the ones that I already know. Those are the ones that I already have details of anyways………that’s why they are called “known” !! I want to connect with industry professionals that I don’t know but would like to know and why should my account be ‘restricted’ because of that. I find that extremely frustrating. Its like going to a professional meet or event or seminar and meeting other professionals and exchanging your biz cards. As per LinkedIn, I should be ONLY be exchanging my business cards with the ones I already know !!! Great article. Very informative. I’m one of those few i guess who have turned against LinkedIn and its policies. In the excuse that LinkedIn always puts its customers needs first is such a hoax. They changed their Inmail policy purely for the reason of generating income. Honestly said, the only good feature of a Premium account was the ability to send Inmails to people outside your connections and receive them back as credits if you dont get a reply within a week. By restricting Inmail credit is blatently such a $ making focus for LinkedIn. This isn’t the first of their morbid ways. They have made their objective clearer and clearer by the years! Its al about the….. I agree w Jean, InMails are worthless now. It looks like the field is wide open for an alternative to LNKD. I could not agree more about how LinkedIn is getting to hard to use for networking. Is there any other site out there for business users to be able to network with other business users inside and outside of their industries. I am looking for something that is more like a combo of LinkedIn/Facebook/Business After Hours networking event. Why would I use LinkedIn to continue relationship where I already have their email address????? One potential site for you to consider is Twitter. If you go this route, like any social media website, take time to give it a try and learn about the nuances at that specific site. Hash tags “#” and Twitter go hand-in-hand. I have found that one way to discover my target audience is to search for people tweeting about a industry event. I do this by searching for the #EventHashTag. Then join the conversation, add value (do not sell) then selectively follow the ones you would like to get to know. At LinkedIn, you have a connection, at Twitter, you have followers. Once you are following each other you can privately message back-and-forth. In one way LinkedIn is similar to Twitter. The true magic happens when you take a online search result and develop it into a real world relationship. Where at LinkedIn you can like, comment and share a connections content, on Twitter, you reply, re-tweet, and favorite (similar to like) their tweets. In addition to the social media websites you mentioned in your post, plus Twitter, there may be forums specific to your market. I am involved in two forums that are specific to my market. I’m also involved in one closed yammer networking group. Of course, one way to become more connected to your core network is to connect with them on multiple sites. For what its worth, I expect all major social media sites to add more fees and other revenue producing enhancements as time goes on. They are, after all, for profit companies. I couldn’t believe it when I discovered the Personalize Invite option had been removed. Or perhaps “very well hidden” is a fairer description. Like others have commented I’m seriously beginning to consider what options there are for replacing Linkedin. They just seem intent on removing everything that made it such a valuable networking tool. What the hell is going on with them? I use to like Linkedin. We use to be able to do a lot of stuff for free. Now it is getting to the point where you have to pay for almost everything. They have a real problem with us connecting with people who are just in our group or they think that we don’t know. Who cares. Let me be the judge of that. They have just gotten to be a bunch of money hungry tycoons! This is called social media Linkedin. We are suppose to connect with each other. Just watch, someone is going to come along and offer something very similar to Linkedin without so many restrictions and for a lot less money. Good article, one thing I should mention that is helping me is using Pulse to target specific groups of people by tagging articles with #tags. 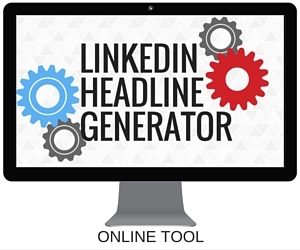 Everyone that likes it spreads it round their network for you and therefore increases your presence on LinkedIn. Linkedin are all about jobs, lets face it, they are a job board disguised as a networking site. Hello, I am trying to find out if the person you are trying to connect to sees the option you choose when you answer the “How do you know so-and-so?” prompt. Does the person see what you selected when they are sent the invitation?